Editor's note: It's National Popcorn Day! We're celebrating by bringing back this tale, first published in 2014, about the history of the beloved snack. Popcorn is a truly ancient snack. Archaeologists have uncovered popcorn kernels that are 4,000 years old. They were so well-preserved, they could still pop. Dolores Piperno, a paleobotanist with the Smithsonian's Tropical Research Insitute, says corn, and specifically popcorn, helped lay the foundations for the Aztec Empire. "When you have a very highly productive crop like corn, that makes the rise of high civilizations possible," she says. Piperno grows the wild, great-grandaddy of modern corn — a weird grain called teosinte. It has just a few kernels on each stalk, and they're too hard to eat or to grind into flour. But teosinte has a special property that almost makes up for these shortcomings: It can pop. "All early corns were popcorns," Piperno says. "They were around for millennia before these other forms of corn." After a couple of thousand years, the Mesoamericans managed to cultivate varieties of corn that were good for flour, but they still ate popcorn. The Aztec language even has a word for the sound of many kernels popping at once — totopoca. After the Spanish invaded, popcorn spread around the world, and soon people began to figure out how popcorn actually works. It turns out that rock-hard kernel — the thing that makes teosinte and popcorn impossible to eat raw — is the key. "It acts as a pressure cooker," says David Jackson, a food scientist at the University of Nebraska. He says the durable kernel keeps water and starch sealed inside. When a kernel is heated, the starch liquefies and the pressure builds until the seed coat breaks. "The pressure cooker essentially fails, and it explodes outward into a popped kernel," Jackson says. The liquefied starch froths outward, cooling and solidifying in a fraction of a second. If you look at a popped kernel under the microscope, you can actually see the bubbles that were formed by the expanding steam. 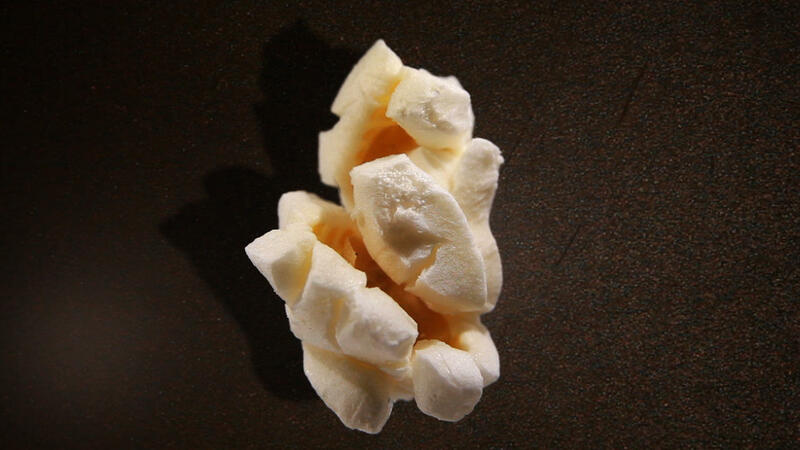 That's why popcorn is so light and fluffy — it's made of bubbles. There's something to think about next time you're stuck watching a bad movie.